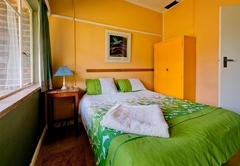 Greyton Ecolodge is a property providing self catering in Greyton for tourists visiting the Cape Overberg region. 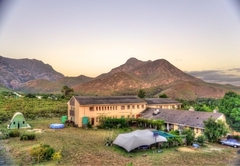 Greyton Ecolodge is situated close to the centre of Greyton, Park Street to the South and fynbos commonage to the North. Walk out the front door and you can be sipping cappuccinos at one of the restaurants in 5 minutes; walk out the backdoor and you are in fynbos in minutes, with no buildings between you and the Riviersonderend Mountains. The best of both worlds! 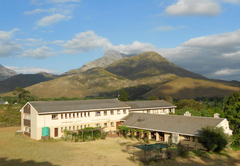 Greyton Ecolodge is a renovated School Hostel. Colourful and spacious, we guarantee no chocolates on the pillows. However we do guarantee hot water, clean rooms, friendly service and the best views in Greyton from your bed room. 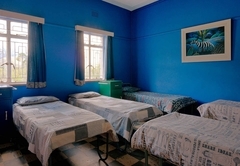 We have eight, five bed dorms and six twin / double bed rooms. The bathroom facilities are plentiful, please be aware that there are no en-suite rooms at all. 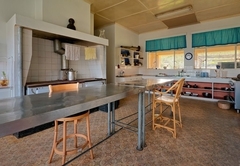 There is a spacious kitchen and large dining room for self-catering as well as braai facilities. The small rooms are in a separate wing of the building with their own kitchenette, lounge and bathrooms. Because you would rather buy your own chocolate! (There is a chocolate factory in Greyton) and you place a higher value on experiencing the area and treating yourself to a meal out, than on too- soft mattresses and percale linen. 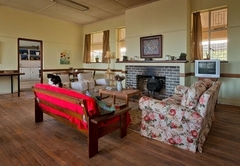 We make staying in Greyton affordable for those with families and large groups. Our guests like the simplicity, peace and quiet and our rates. Hiking groups, church groups, budget conferences. Couples and families from the city. Foreign backpackers. Mountain bikers and trail runners. School groups. Birthday party groups. Family reunions or get-togethers. The beautiful and accessible mountains; numerous hiking routes. The beautiful streets of Greyton. The Saturday morning market with its focus on local produce and very tempting edible stuff. 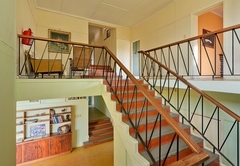 Historic Genadendal only 7kms walk or drive away. In summer - swimming in mountain pools and in winter - snuggling up around a fire. For the more adventurous there are two longer hikes, the Boesmanskloof Trail to McGregor and the Genadendal Trail (both need permits from Cape Nature). The hot springs in Caledon are a good place to spend time on a winter’s day. For those wanting to spoil themselves there are several restaurants for coffee and meals. The place was clean and the staff was friendly, I will definitely go back.